The egg is a marvelous food item. Where else can you find a significant source of protein (6g per egg) in an easy-to-handle, neat package, all for only about 70 calories and at a cost of about ten to fifteen cents? Now, the goodness of this nutritional powerhouse comes encased in a hard outer surface known as a shell. The savvy cook learns to break through this surface in order to access the goodness found within. The process of breaking through the protective surface is known by the scientific term cracking. Here's what you need to know about the process of cracking eggs. 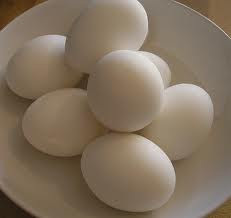 You will need an egg (or eggs) to crack and a vessel into which you can deposit the inner contents of the egg. Hold the egg firmly in one hand. Tap the center of one of the longer sides of the egg lightly but sharply against the edge of your vessel. 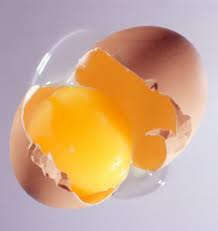 You should see a crack appear in the shell; if not, you have not tapped the egg sharply enough and you should try again. Once you have established that a crack indeed exists in the shell of your egg, take the egg into both hands with the crack appearing on the upper side of the egg. Using both hands, hold your egg over the vessel and gently use your thumbs to pull the crack into a frank opening. Aim your egg slightly downward so that the contents of the egg will land in the center of the vessel. You may then dispose of the egg's shell and proceed to use the contents for any one of various culinary uses. You crack ME up! Too funny. Thanks for the laughter and fun I find in your blog.